Financial Market Vigilante: Interest Rates Up - Senior Bank Loan CEFs and BDCs Down, What’s Up? Interest Rates Up - Senior Bank Loan CEFs and BDCs Down, What’s Up? 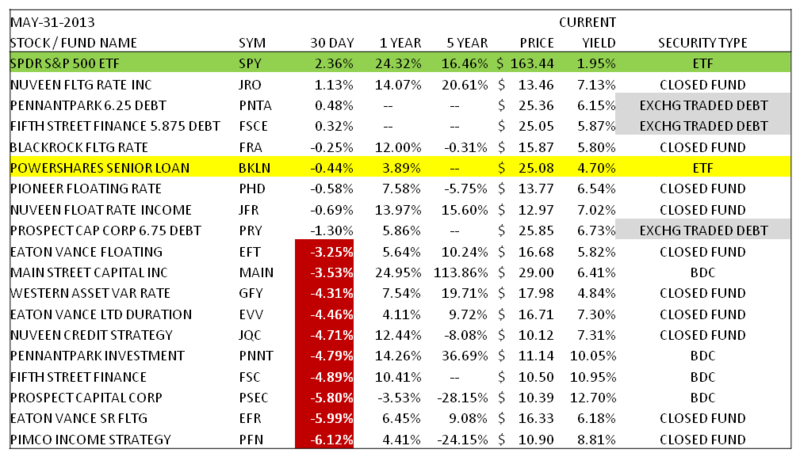 In my recent articles concerning the upward directional change in interest rate ( Data Shows Interest Rates will Continue Higher In 2013 - What to Do Now ) I have described strategies which are intended to hedge or deaden the blow of basis loss in an investment portfolio as the market trades lower in price, higher in yield on fixed income investments. One of the strategies that many investors assume should work is the purchase of variable rate bank loans, either through a Closed End Fund, [CEF] or a Business Development Corporation [BDC]. But when you look at the market trading data since the beginning of May across the board on these companies, there is a definite under performance in the issues. It is an under performance which in relative magnitude equals the decline in the highest duration Treasury ETFs. A bank loan which is variable is supposed to be a low duration, not high duration security. So, there must be something else going on which is driving the trading pattern across an entire market sector; and, I will explain what it is in this article. 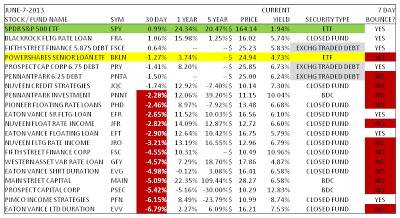 First, take a look at the performance of a wide range of CEFs and BDCs in the month of May. 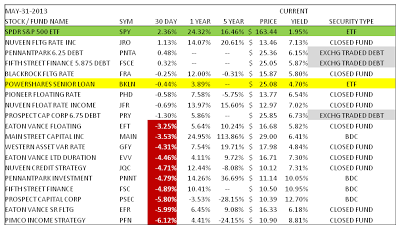 In the table below I have listed the fund name and ticker symbol so you can do your own research if you desire. I have shown the performance of the securities over the last 30 days, 1 year and 5 year periods along with the current yield and price level of the shares when the data was captured. In addition, I have added additional information associated with the BDCs, the recently IPO ed exchange traded debt issues of each one shown in the table. I will let you know I have included this piece of information after explaining why the CEFs and BDCs are not performing as one might expect as interest rates have begun to rise. After reviewing the information for the month of May, it is useful to look at the continued performance into the first week of June. During this past week, the S&P500 (SPY) did a mini-correction for the first three trading days. The market fell through Wednesday during the week to a point where its 30 day return was at break-even. During that time, many of the interest sensitive areas rebounded from the drubbing they took in May. Some issues in the large cap dividend, telecom and REIT space made some comebacks. But the leveraged loan sector, as shown in the chart below by and large did not bounce. The share price levels at the end of the month were typically higher than the price level of the shares after 5 days of trading June. And the performance level is still worse than the negative performance to the longest duration Treasury bonds. There are several factors which are inter-working to create a security functions like the CEF and which are suppose to hedge interest rate risk, but instead act to magnify the problem when rates begin to rise. They involve the high leverage carried by entities as well as the changing market assessment of the underlying asset quality held by the entities after an extended period of very low interest rates. During the year 2004 and early 2005 many new issue variable loan CEFs were introduced onto the market. In typical fashion for many Wall Street lead IPOs, the funds were sold to the public at a high point for the Net Asset Value of the loans in the funds. As the interest rate policy to move rates up was actually implemented, the leveraged loan index began to weaken. Why? Because in a rising rate environment, business loans as a group get riskier. And, the low interest rate level that the loans were we issued would not fully begin to actually “float” higher typically until the LIBOR rate moved higher by at least 1% from the point the assets were valued at IPO. Whack – say good-bye to a portion of the net asset value. Additionally, these funds are highly leveraged, usually close to the statutory maximum of 2:1 or 40% effective leverage. If the underlying net asset value declines at all in the assets, some assets will have to be sold. This causes a downward cascade in asset value across the entire sector. 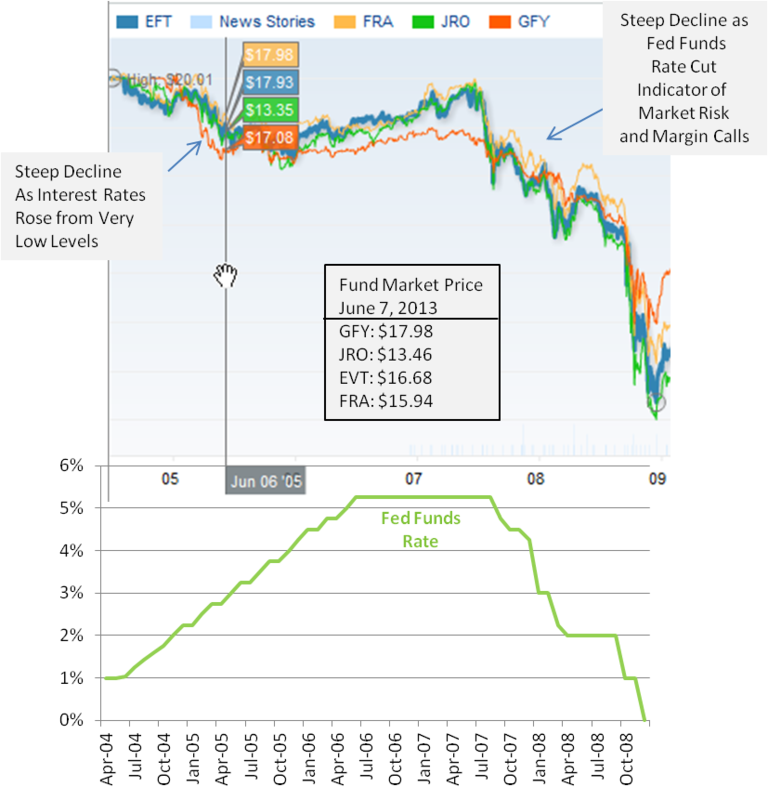 As you can see in the graph, the CEFs across the board in 2005 declined in value until reaching an intermediate term bottom at the end of the year. From 2006 to mid-2007, the variable bank loan CEFs actually began to hedge the upward movement in market interest rates, and underlying net asset values (NAV) improved. But as we know from history, the underlying economy was unstable and over-leveraged. It is interesting how these issues signaled the eventual stock market collapse in September of 2008 and early 2009 so far in advance. The value of the variable bank loan funds collapsed right in synch with the drop in the Fed Funds rate from mid-2007 through 2008. The current signal from the poor performance of the CEFs and BDCs I do not believe is currently an impending collapse signal. But then again, the Fed has not as yet begun to actually raise the Fed Funds rate. However, the Fed Funds rate may not be a good indicator of rate increases in this upcoming rate increase cycle. The Federal Reserve is committed to keeping the short end of the term structure of interest rates “artificially” low by paying interest rates on reserves to banks. However, LIBOR, which the loans are tied to, should not be distorted as rates rise. Back in early April of this year, I published research articles on three separate BDCs (PNNT) (FSC) (PSEC) warning that this is not the time to be buying these type of companies at market prices above net asset value. You can access these reports on my web-site (Financial Calculus). The correction to a point where most of CEFs and BDCs are trading at a discount rather than premium is the first stage of the adjustment to the changing Federal Reserve policy. If s CEF or BDC has not corrected yet, then it is likely they will fall more than other funds in the near term. As a group, these asset all trade with a very high degree of correlation. There is one outlier right now. It is the Blackstone Fund (FRA). I do not have a rationale as to why it is outlier over the last 5 weeks. It is, based on historical analysis, trading at only 80% of its original IPO price level, while many of the CEFs are much closer to the original issue price 8 years later. This may mean they have non-performing loans on the balance sheet which there is an expectation will become performing again, and therefore the distribution rate will be increased. If nothing materializes, I would expect FRA to correct soon. As a last point, I will explain why I included the exchange traded debt of Fifth Street Finance, Pennant Park and Prospect Capital in the tables above. The debt in these companies makes up a portion of the 40% leverage that each of these companies hold on their balance sheet. It is in a sense a margin loan at a high relative interest rate. The issues are in the 10-15 year maturity window, which you would expect makes them a high duration issue. However, they are trading with very little down-side volatility at the present time. If there was a run on these issues, it would be a definite signal of a 2008 event, but there is not. In a rising rate environment, assets which are non-correlated to a rise in rates are what you need in your portfolio. On this measure, the exchange traded debt of the BDCs is actually a better investment than the CEFs at the present time which are undergoing valuation pressure as rates are just begin to rise. I remain a bear on the BDC and leveraged CEFs for the intermediate time period until the correction is complete. This will not happen until the loans in the portfolios reach a point where rates can be increased, and the distribution levels of the CEFs are on the verge of increasing distributions. This may be a year or more away. ETFs without leverage such as (BKLN) in the variable rate sector should perform better than the leveraged fund during this time period. Daniel Moore is the author of the recently published book Theory of Financial Relativity - Investment Portfolio Guidance for a Fed Driven Bubble Prone Deflationary Era. All opinions shared in this article are expressly his own, and intended for information purposes only. After lolking over a number of the blog posts on your web site, I really like your way of blogging. I savdd it to my bookmark website ist and will be checking back in tthe near future. Here your method of presenting a blog is really very nice.Especially your facts & figures and graphs are helping us in understanding your article. I have never read this type of article before.Thanks for your posting it here.